Boston Mob Victims' Families Press On In Court Fight Relatives of alleged victims of former mob boss James "Whitey" Bulger sued the FBI for compensation, arguing that the agency mishandled its relationship with its mob informants. A federal court awarded them millions of dollars, but government lawyers appealed. They're back in court Thursday. 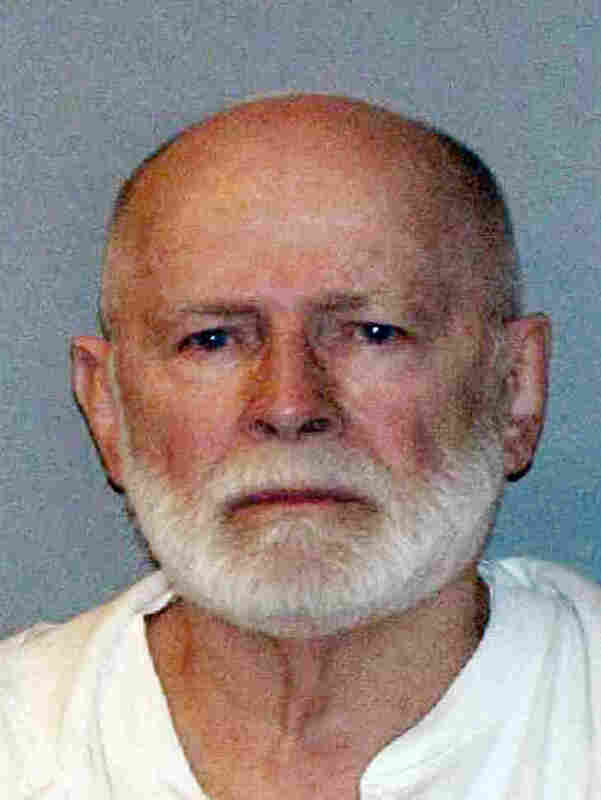 James "Whitey" Bulger, shown here in a June 2011 file booking photo, was captured in Santa Monica, Calif., with his longtime girlfriend Catherine Greig. On Thursday, several families who sued the FBI and won millions of dollars in 2009 will be back in Federal appeals court in Boston, fighting government efforts to overturn those judgments. Steve Davis, whose sister Debra was killed in 1981, calls the government's appeal "disgraceful." He still gets worked up thinking about the day he heard mobster Stephen "The Rifleman" Flemmi admit in court that he lured Debra into a house and watched Bulger strangle her to death. Davis literally lunged at Flemmi and was dragged from court, enraged not only at the mobsters, but also at the FBI. At the time, Davis was just learning the FBI was using Bulger and Flemmi as informants and seemed willing to let their prize "snitches" get away with murder. "It's sick," Davis says. "The government that was supposed to uphold and protect us. They weren't protecting us, they were allowing this to happen." Davis is one of several victims' relatives who won nearly $3 million in 2009, arguing the FBI's corrupt relationship with Bulger and Flemmi was partly responsible for their loved ones' murders. "All the lives that were take in all the years, 16 or 17 lives could have been saved if they took [Bulger and Flemmi] off the street," Davis says. The families' attorneys declined to comment, but William Christie, who represents other relatives in similar lawsuits, says there's no question that the FBI is liable for turning a blind eye to Bulger and Flemmi's violent ways, and for failing to control the mobsters it had teamed up with. "It's sort of the type of theory: You let a wild dog loose in a park and the dog ends up biting somebody, the owner of the dog is responsible," Christie says. But government lawyers say it's a stretch to blame the FBI. They also declined to comment, but in court papers they argue that the FBI couldn't have known ahead of time who was going to be killed. And there's no proof that the murders wouldn't have happened anyway, regardless of what the FBI did — or didn't — do. The government also argues that the damages were way too high, and the families made their claims too late. Earlier this year, government lawyers used that same argument — that the statute of limitations had expired — to appeal two similar cases, and they did get those multimillion-dollar awards thrown out. "We consider it bull crap, know what I mean?" says Tommy Donahue, whose father Michael Donahue was killed by a spray of bullets believed to have been meant for someone else. After spending years, frustrated, that Bulger continued to evade capture and avoid prosecution, Donahue was thrilled to get a civil judgment against the FBI so at least someone would be held responsible. But when the government then launched an appeal and continued to argue the FBI should be let off the hook, "It was sickening to me," Donahue says. "How can you give someone the green light to go around, murder people and sell drugs in the city and not feel like they're responsible? That's beyond denial — that's almost pathological." "It is appalling that the government refuses to admit error," says Boston defense attorney Harvey Silverglate. "But I've been doing this kind of work for over 40 years. It isn't surprising." The government, especially, has an obligation to make amends for its mistakes, he says, but ironically it won't do itself what it demands everyday from common criminals. "The government insists that acceptance of responsibility is a major factor in sentence reduction, and yet it's the one thing that government is worst at," Silverglate says. Victims' families say they're not holding their breath for any heartfelt apologies, but having a court say what the government will not would at least be something. Previous audio and Web versions of this story incorrectly referred to Harvey Silverglate as a Harvard law professor. Silverglate is an attorney in Boston.